I didn't realize it then, but that was to be my last week of freedom for a while. Jeanine King was still in the hospital so she requested I help out at Community Maintenance until she could return. Her boss, Art Spitzer, called to make the offer on Saturday, October 22nd, and when I asked when he would need me he said, "yesterday". So, since I had been toying with the idea of going to work anyway, and because wives could make such good money there, and because Jeanine was such a good friend of mine, I agreed to do it. The very next day, Sunday, I found myself sitting in Jeanine's office trying to look and act like I remembered how to do general office work, type, answer the phone, and remember the names of all the different foremen, painters, plumbers, electricians and carpenters of every nationality you can think of. I knew most of the other women in the building, one of whom was Sheila, who worked in Contracts. A very nice Pakistani named Faruq, who was in charge of supplies and had his desk in the same office was extremely kind and helpful. He knew all the procedures and the special needs and wants of the Superintendent, Art Spitzer, as well as having the key to the supply room. Of course all the employees were helpful and friendly, so I felt at home right away. And my first duty each morning wasn't that hard, making coffee. As I carried the coffee pot down the long, narrow hall, I was able to see in almost every office and say good morning to each one of them, so it helped me learn faces, names, and the work they did. It made me popular with them as well, as a lot of coffee drinking was done and enjoyed by all, as the crews came and went out into the community to do their maintenance jobs. 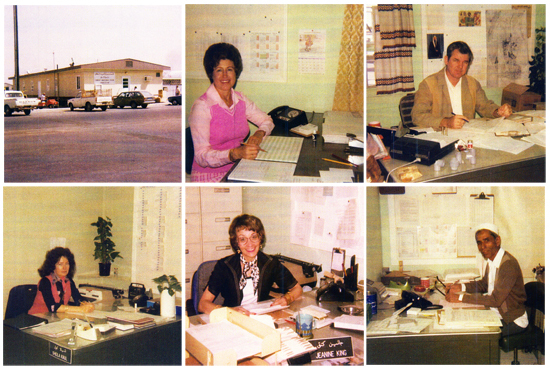 The Community Maintenance Building; Colleen at her desk; Art Spitzer, Superintendent; Sheila Kaul, Superintendent Secretary; Jeanine King, Contracts; Faruq, Pakistani in charge of supplies. It was a really busy office, and hectic at times; I didn't know how long I could keep up the pace, but I really liked it. Fortunately, the long, narrow, wooden portable Community Maintenance building was located on 11th Street, just two and a half blocks from our apartment, within easy walking distance. By 6 o'clock each morning Oran was well on his way to his job in Mubarraz, so our schedules did not conflict. In fact, I hardly ever left the house before 6:50 and made it in plenty of time before the 7 o'clock whistle. As I arrived at the building each morning the steps that led to the entry door were littered with the U.K. employees, so I had to practically crawl over them to get inside. There were cheery ‘hello's, smiles, and light banter, and of course I could detect their interest in the presence of a female employee, so it wasn't hard to take. They were all so nice, and seemed eager to please. What a life! It was nice to see them and recognize them when I was out and about in camp, too. Sheila and I became closer during that time, as well. She had a car and most days at 4 o'clock we left together, went by the Post Office to see and be seen, then went to one of our houses or the Snack Bar for tea. Sometimes we would go to the pool to relax and get some sun. We talked about all the daily happenings and the different employees of all nationalities. That helped familiarize me with each individual who worked there. We also talked about our Sorority and Foremen's Group activities, which we both always attended. One of the foreseeable problems was that our social life picked up a lot right at that time and I didn't want to give that up, so I hoped I could keep up with everything. At that point I didn't know how long the job would last, anyway. The very first weekend after I started to work was a busy one. Jim and Sharon Morris were back in Arabia on business from Bahrain and spent Thursday night with us. We all went to a barbecue supper at Elaine and Larry Swishers next door. It was for all the Santé Fe employees who lived in camp and the surrounding area, most of whom we knew. It was good to see Sharon and Jim again, and we talked more seriously about our visiting them soon in Bahrain, although I didn't know how I was going to work that in so easily now that I was working, but we planned to try. The next day, Friday, October 28th, 1977, was the A.E.A. and Women's Group parade and fair on the Clubhouse Patio. The theme for this was the "Roaring Twenties", so there were some nifty floats and costumes floating around Abqaiq that time. 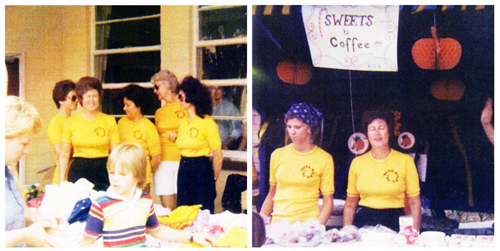 Our Sorority didn't have a float, but did set up a booth selling sweets and coffee. We wore our Beta Sigma Phi T-shirts. All organizations had booths to either sell food or some product. There were also rides for the kids, a cake walk, a grand stand show and a swimming and diving exhibition by Olympic Gold Medal winners, Don Schollander and Mike Finnernan. It was diverse and fun. We took turns working in our booth and then walked around partaking of all the other things. Roaring Twenties Fair: Sorority members with customers; Kathi and Colleen selling Sweets and Coffee. Our activities carried over into Saturday night as we went to a retirement dinner at the Golf Club House for Patti and Burl York. Even though they had been living in Dhahran for awhile, we had remained good friends and would miss them. We didn't know it at that time, but we would remain in touch and continue our friendship even after we both left Arabia. Also on Saturday, October 29th, 1977, the Udhailiyah Women's Group Portable was officially opened, and 37 of the 55 wives living in camp then attended. Monday of that week would be Halloween night and the kids in camp would trick or treat, of course. Word had spread through camp that a shipment of candy had arrived in the Commissary, so our boss, Art Spitzer, let all the women in the office go there, two at a time, to get what we would need for that night. I would find out that he was probably one of the most thoughtful bosses any person could ask for because of this gesture and other things that happened while I worked at Community Maintenance in Abqaiq. That night Oran and I sat on our porch again and passed out the candy and enjoyed the costumes of the kids who came by. Another country entertainment group, Danny Davis and the Nashville Brass, performed in Abqaiq on Thursday, November 3rd. Our whole foremen's group went to Sheila and Keith Kaul’s for cocktails, then to the Gymnasium at 9:00 for the show and dance. Afterward, Oran and I went to Estella and Bell Sypher’s for Mexican Stew and retried beans. It doesn't sound like the kind of thing you would have after a dance, but it was delicious, as usual. Jeanine finally came back to work during the next week, so I thought my working days were over, but some of the other women had been off sick as well, or gone for various reasons, so Art asked me to continue working until everyone got back. I was going to help out anywhere I was needed, so I started out in the front office on the right as you entered the building, which was known as "The Hen's Coop" . That was where all the small maintenance jobs in camp were coordinated basically, and where several women took the calls that came in constantly. They were jokingly referred to as, "the call girls". At first I didn't even have a desk, but just sat by the side of the desk of any other woman I was helping at the time. In between work (and there was a lot of it) much light-hearted banter and joking went on between the maintenance men coming in and out to get their assignments and coffee, and the women. Coworkers at Community Maintenance: John Newton, U.K., Contracts; Jeoff Lewis, U.K., Foreman; Keith Harris, U.K., plumber; 4 Maintenance men, U.K., painters, plumbers, electricians, and carpenters; John Roarke, U.K. foreman with Arab maintenance man; Abbas Al-Makki, Arab Foreman. I learned a lot about the different countries that make up the U.K. (England, Scotland, Wales, and Ireland). I also learned how different they all were and some of the conflicts between them. Some of the U.K.'s were engineers and worked in other offices throughout the building, such as Contracts, where Sheila worked. Their work schedules were different from the Americans and they made more frequent trips home on vacations. Some were in Arabia 4 months, then flew back to the U.K. for a 2 week vacation. Others were in Arabia 6 months, then were on vacation 3 weeks. It all depended on the area of work they were in. A lot of them brought us back little gifts or mementos from their countries. One brought me a commemorative plate for Queen Elizabeth's 25th year as monarch of England, as it was that year, 1977. 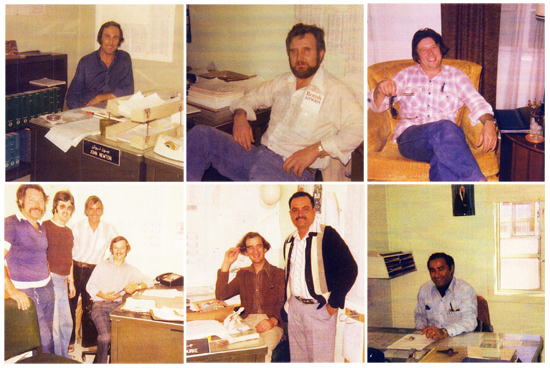 Working in the building were also Arab supervisors, foremen, and maintenance men, one Philippino, plus other nationalities I became acquainted with and learned about. Two of the U.K.'s I would later work with in Udhailiyah Community Maintenance as well, John Roarke, Erik, and an Arab, Abbas Al-Makki. Moving around the different offices so much and running errands all over the building afforded me this wonderful opportunity I will always treasure. One day the Arab foreman, Abbas Al-Makki brought his sister to the office to meet all the women. She was fully robed and veiled, as all Saudi women in the Eastern Province were. She was brought into "The Hen's Coop" office, where all the other women had gathered. We served coffee and some cookies that had been brought that day, visiting with her as Abbas interpreted. It was really fun and enlightening. There was always an unexpected surprise waiting around every corner in that lively, fun, enjoyable department, and it gave me a much needed "shot in the arm" during that time frame in Arabia. It really changed my life.